Mark Norman joined Prime Commercial Real Estate in 1997. Mark specializes in the Property Maintenance of office, industrial, and retail properties in the Treasure Valley. 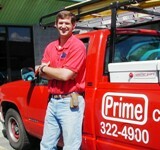 Mark focuses his time into making sure all of Prime's maintenance needs for our tenants are met in a satisfying manner. Mark and his wife, Beverly, live in Nampa. Mark and his son, Brian, participate in a Judo club. Mark and Beverly like winning contests, watching sports and traveling. Mark has two children Brian and Alicia.